Vinyl records – a fashionable music format for the 21st century. 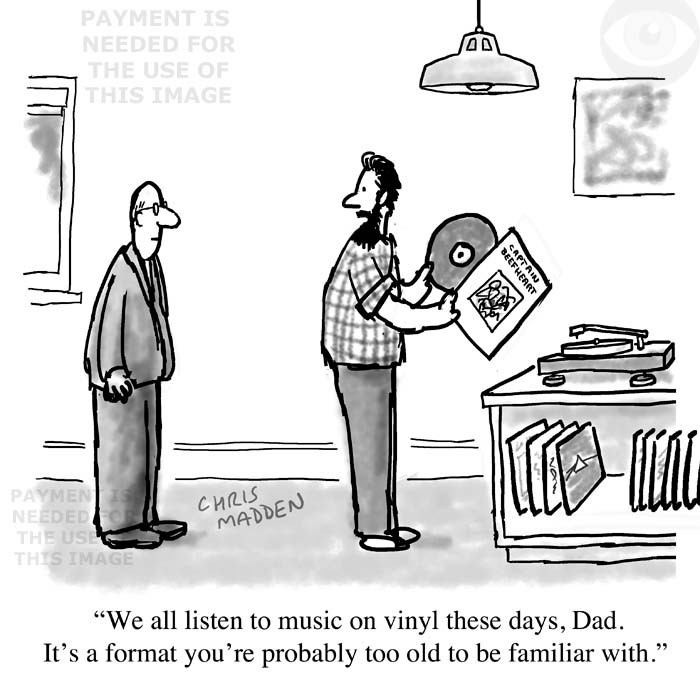 A hipster explaining to his father that modern young people listen to music on vinyl – as though it’s a new format that older people wouldn’t understand. This cartoon is about the way that young people often feel superior to older people because older people aren’t necessarily up to date with technology. The cartoon is about the psychology of youth – about the way that young people often fail to appreciate the fact that their modern world was created by people who went before them. The fact that the music format being used is an old fashioned or retro format, while the young person in the cartoon still feels superior to the man who grew up with the technology, is part of the joke about youth setting itself up as superior to age. The young person in the cartoon is a hipster – a youth sub-culture of the 2010s. It’s a cartoon about the generation gap. An optimist who insists on looking on the bright side of everything can be very irritating. A woman driven to murdering her husband because he is unrelentingly optimistic all of the time. 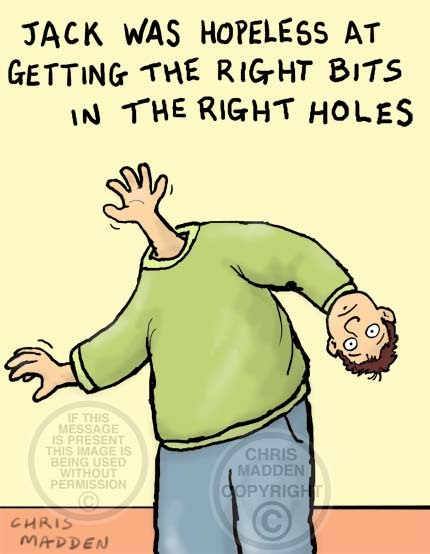 A cartoon about optimism, personality traits, positivity, looking on the bright side. Food that isn’t ‘locally sourced’. 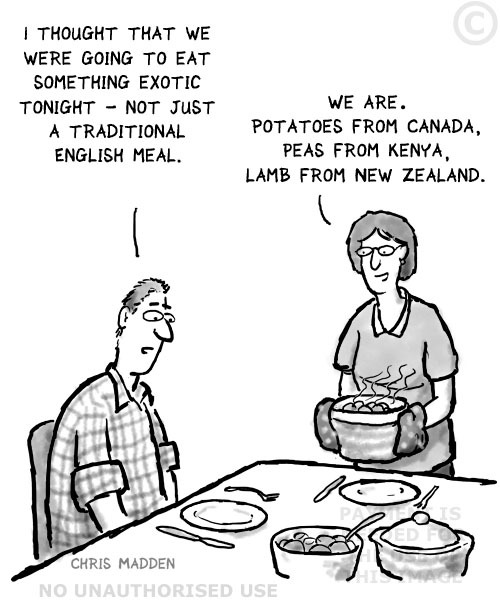 A cartoon about the fact that a huge amount of food consumed in the UK is imported rather than grown in Britain. Many of Britain’s staple food, from potatoes to carrots, are grown in Spain, Africa, Israel, New Zealand etc, instead of being ‘locally sourced’. A cartoon about gardening and male behaviour. A cartoon about laziness, seasonal activity, the seasons in the garden, the rhythms of nature, lethargy, stereotypical gender roles, cliches of masculine behaviour, seasonal behaviour. A cartoon about gardens and gardening, with a bit of gender politics thrown in. A cartoon showing a man carefully cleaning his garden fork, while his wife looks on and complains that he spends so long cleaning his garden tools but won’t do any cleaning in the house (He’ll clean the garden forks but not the kitchen forks). A cartoon about domestic gender roles in household work, sexual stereotypes, gender equality. Cartoon about advice on how to live your life. 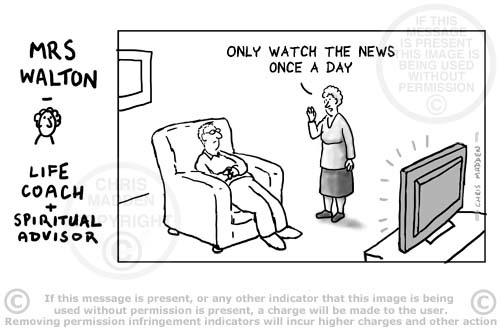 The cartoon shows a ‘lifestyle guru’ telling someone to only watch the news once a day. Some people (myself included) watch the news far too often. One of the problems with the broadcast news on tv is that it is extremely superficial, especially when broadcast on a 24 hour rolling news channel. Watching the news sometimes gives the illusion that you are actively engaged in the news, however, we should really be doing other things instead, such as reading books and magazines that analyse and explain in greater depth the implications of the news events of the day. The news is ‘noise’. This analysis of the news is similar to that put forward in the book by Alain de Botton, The News. 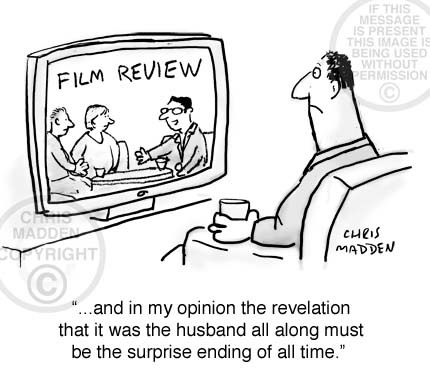 The cartoon predates the book. This cartoon is from a series about the phenomenon of gurus, personal counsellors, lifestyle coaches (a recent and rather ludicrous twist on the phenomenon of personal fulfilment), motivational speakers and suchlike. In the series the guru, counsellor or what-have-you is a very ordinary middle aged woman rather than someone who is removed from the humdrum of everyday life, and is meant to represent a parody of lifestyle advisers and self improvement gurus. Cartoon about truth, knowledge, opinions, prejudice, bias, philosophy, lifestyle, lifestyle coaching, gurus, motivational speakers, therapy, counselling, current affairs, engagement in society. 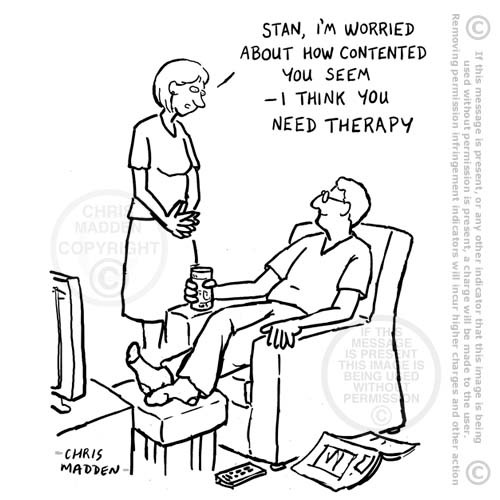 Psychotherapy (or just plain therapy) Cartoon. Happiness cartoon. She is over analysing people’s moods and even diagnosing happiness or being happy as a mental condition that requires treatment. Happiness cartoon. 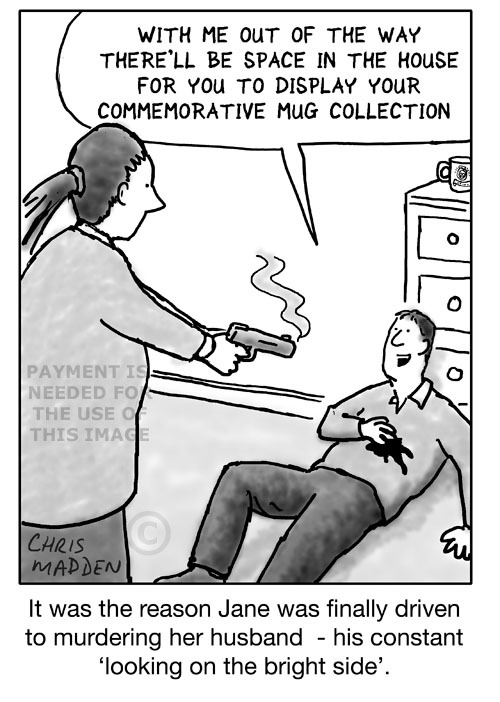 A cartoon about the potential over use of therapy, analysis, counselling, psychology, psychiatry, psychotic states. 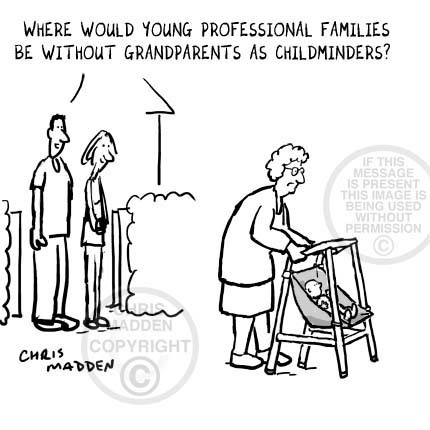 A cartoon about the fact that older people are slower thinkers than young people. However, they are also deeper thinkers. Cartoon. Old people are often dismissed as slower thinkers than the young (especially by the young). However, due to their maturity they are also deeper thinkers than the young. This depth of thought is often overlooked and ignored by the young (because younger people have more superficial thoughts). In this cartoon the thoughts of older people are likened to the flowing of a great river as it nears the sea – slow and deep – with the thought processes of younger people being compared (by implication) to the rapid, shallow, tumultuous flow of streams nearer the river’s source. Slower brian function is often equated with loss of brain function, however this doesn’t necessarily imply a simple correlation with inferior brain function. Of course degenerative brian diseases are another matter. A cartoon about diminishing brain function in the elderly, brain degeneration, mental skills, IQ tests, intelligence, brian function, wisdom, cognition, cognitive impairment. Cartoon – the difficulty for older people to understand modern technology. A woman having trouble programming a modern digital television tuner (or similar electronic device). TYounger people adapt to using modern technology naturally (as they know nothing else). 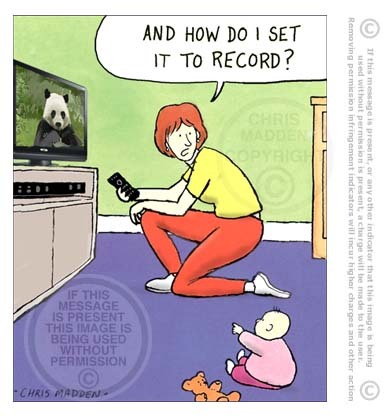 The joke here is that the child who understands the new technology is a baby (who understands very little indeed in general). A cartoon about child development, generational differences, generation gap, early learning, knowledge acquisition, technological illiteracy. Naughty step cartoon. 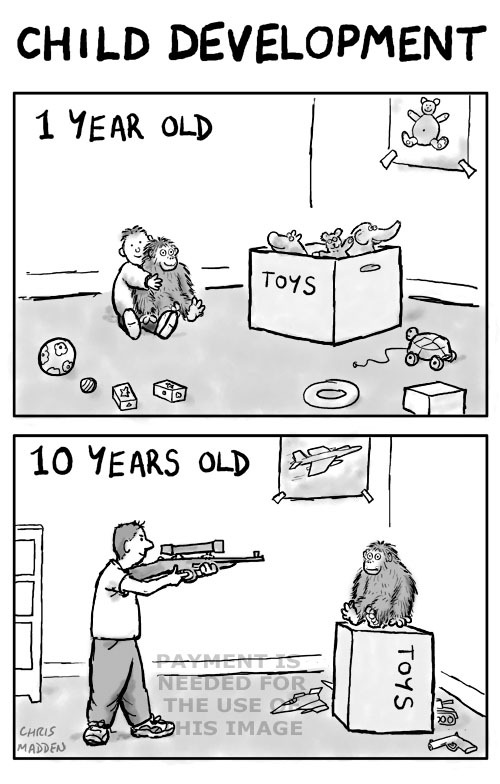 A cartoon about parenting and parenting skills. 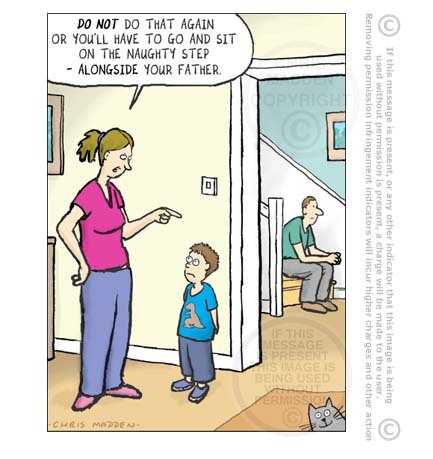 The naughty step is a child discipline technique of the ‘Supernanny’ school of child development. 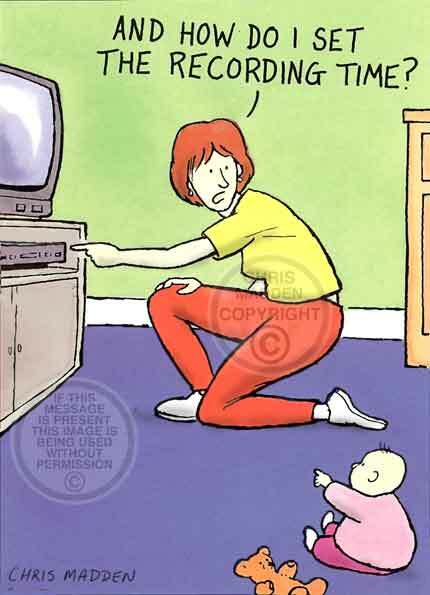 The joke in this cartoon is that the technique has been applied by the mother to her husband as well as to her child. A cartoon about child development, discipline, hen pecked husbands, domineering wife. Cookery cartoon. Cook losing her temper while cooking a Gordon Ramsay recipe. A cartoon about Gordon Ramsey and his bad language and temper. 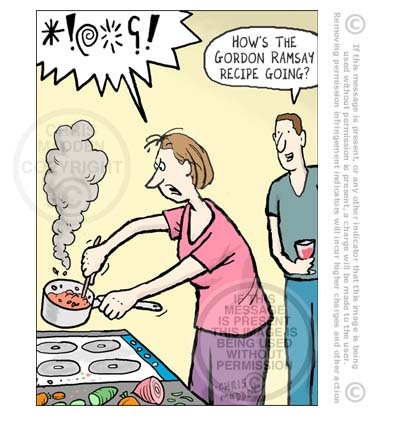 The cartoon is funny because Gordon Ramsey is famous for swearing a lot, for using bad language and for having a bad temper. The humour lies in the fact that the cook seems to be taking on Gordon Ramsey’s personality traits as part of the cooking process. The cook is channelling Gordon Ramsey. Cartoon showing a person who has a football themed bedroom. 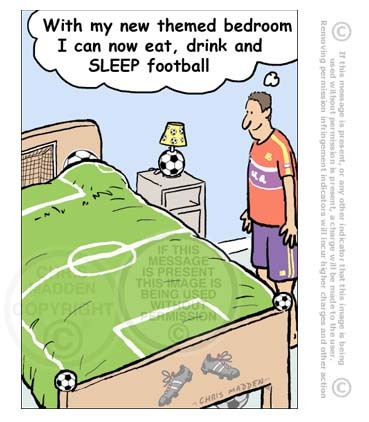 The joke is that because the person in the cartoon has had a football themed make over in his bedroom, with all of the decor and decorations being football related, be can now ‘Eat football, breathe football and sleep football!’ . A cartoon about sports fans, football fans, obsession with football, following football. A cartoon showing a person who has answered Nigerian email scams that he has received – and has found that they are genuine. The humour in the cartoon is due to the fact that the scam emails from Nigeria and elsewhere, often pretending to come from a bank employee or the wife of a recently deceased finance minister or similar wealthy person ar so obviously fraudulent that no one with any sense would take them seriously or assume that they were genuine. A cartoon about internet fraud, scam emails, con men, con man, confidence tricksters, gullibility, credulousness. Computer cartoon. Are computers intuitive to use? Learning how to use a computer – cartoon. A man saying to a woman that computers are totally intuitive to use. A cartoon showing a person using a computer and another person teaching computing skills. A cartoon showing the difference in approach to knowledge and technology by men and women. The woman is unsure of her ability while the man is arrogant and sure. A cartoon about computers and gender differences. A cartoon showing a person using the internet to research information that doesn’t need the internet for the research. A cartoon about the way that people are becoming over reliant on computers and the internet. The fact that the person is looking at the weather on the internet is meant to point out that people are staying indoors in front of their computers rather than going outside. An unhealthy aspect of computer use. A cartoon showing a woman getting annoyed with her computer. A message on the computer screen says “Printer not found”. The printer is alongside the computer. A cartoon about the frustration of using computers and their seemingly nonsensical, inexplicable or unfathomable messages. 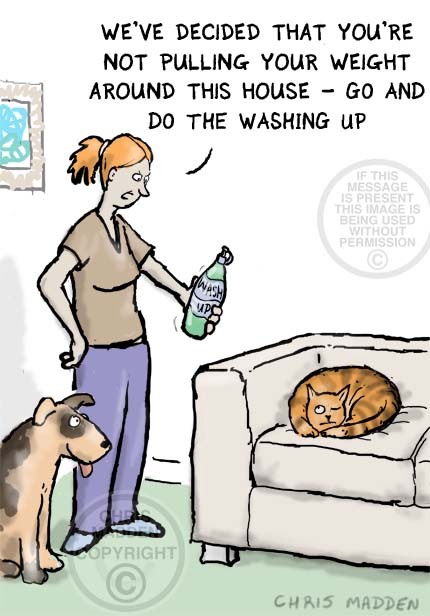 This cartoon was drawn as a greetings card published by Paperlink. Men doing housework cartoons. A vacuum cleaner designed to appeal to men. A cartoon showing a man looking at a vacuum cleaner and being interested in its design and specifications. Some household devices such as the Dyson vacuum cleaner are very muscular and macho, and are probably designed to be targeted to appeal to male sensibilities. A cartoon about gender differences, feminism, gender roles, masculinity, male traits, household chores, product design. Men doing housework cartoons. Men act differently in the company of attractive women. A cartoon showing a man modifying his behaviour in order to impress an attractive woman (possibly subconsciously). A cartoon about gender differences, feminism, gender roles, sexual attraction strategies, deception, sexual display, gender interaction. A cartoon showing a woman complaining to her husband/partner that he’s put the washing machine on the wrong wash cycle, ruining her clothes by making it shrink in the wash because it was too hot. The cartoon shows the different talents/interests/preoccupations of men and women. The man is good at fixing the plumbing, but he’s useless at using the washing machine itself. A cartoon about gender differences, feminism, gender roles, male incompetence at housework. Cartoon. Change the clocks – double summertime. Daylight robbery? A cartoon about the proposal to put the clocks in Britain forward by another hour all year round. This would change GMT to BST and the current BST to double summertime. This system is opposed in parts of Britain, especially Scotland (where it is argued that the mornings would be too dark). The proposed change would generally be an improvement, allowing greater use of the limited daylight in winter. It occurs to me that any campaign against changing the clocks could use the slogan “Daylight Robbery”. A cartoon about GMT, BST, British Summer Time, Greenwich Mean Time. Cartoon. Yesterday’s news. The transitory nature of news. 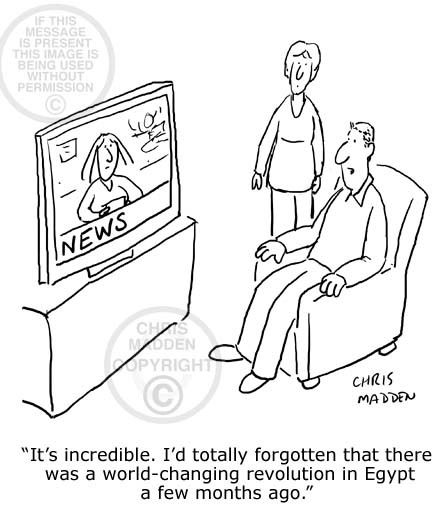 A cartoon showing someone watching the news on television, saying that he’d forgotten that a major news event had happened only a short time earlier (the revolution in Egypt as part of the so called Arab Spring).Cartoon about the fleeting attention span that any news story can command in a world saturated with news events. A cartoon about the speed with which news stories fall into the dustbin of history as the world’s news media move from one story to the next, often giving a story saturation coverage and then moving on. Today’s earth shattering news is tomorrow’s chip paper, as the saying goes. 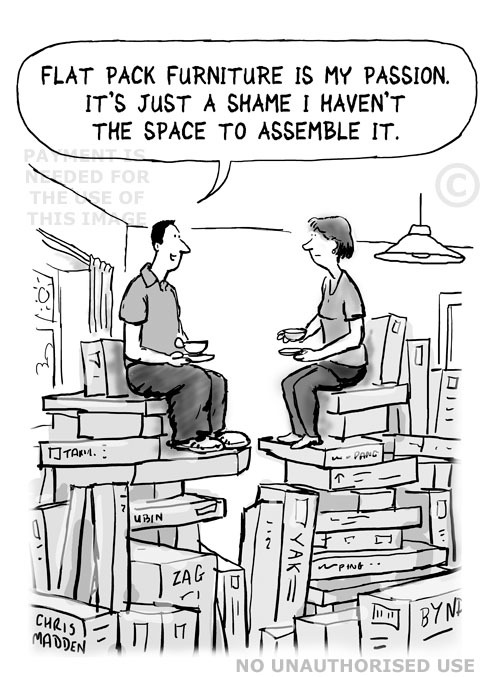 Self assembly furniture cartoon, with the furniture still packed away in its boxes, piled up in the room because there’s no room to put it up. The packs are being used as furniture in their own right. A cartoon about interior design, ikea, modern furnishing. A cat’s owner complaining that the cat is lazy and doesn’t earn its keep. Computer cartoon. Is reading books better than looking at computer screens? Is reading books better than looking at computers? Is reading books engaging in the real world in a way that using computers is not?